This description, the only one I have seen of a pear called ‘Beurré Van Mons’, (or ‘Mont’ in this publication), appeared in volume 10 of The Horticulturist and Journal of Rural Art and Rural Taste, edited by P. Barry and published in the USA between 1853 and 1874. ‘Fruit large, of a curved pyramidal shape. Skin almost entirely covered with dark brown russet, which is thin and smooth. Eye small and open, placed in a very slight depression. Stalk half an inch long, slender, and inserted on the surface of the fruit. Flesh greenish-yellow, fine-grained, melting, and buttery; very juicy, rich, sugary, and with a fine aroma. An autumn dessert pear of first-rate excellence. Ripe in the end of October, and continues three weeks. The tree is very hardy, an excellent bearer, and succeeds well as a standard or pyramid.’ [Hogg – Fruit Manual p.154/1860]. Hogg’s description is of a pear called ‘Baronne de Melo’, with the synonyms ‘Beurré Van Mons’, ‘Adèle de St. Denis’ and ‘His’. [Hogg – Fruit Manual p.154/1860]. However, Le Jardin Fruitier du Muséum describes and figures a pear under the name of ‘Vicomte de Spoelberg’, with the synonym ‘Beurré Van Mons’ [JFM vol 5/1863], and another under the name ‘Baronne de Melo’ [JFM vol.6/1864], again with the synonym ‘Beurré Van Mons’. Jardin Fruitier du Muséum describes ‘Baronne de Melo’ as an autumn pear, the fruit pyriform in shape with yellow skin with patches of cinnamon russet, the flesh white, fine, juicy, with a musky flavour. This accords somewhat with Hogg’s description but not totally. Pears of New York describes ‘Baronne de Melo’ as ‘A variety said to have been raised by Van Mons about 1830.’ [Pears of New York p.260]. ‘Beurré Van Mons’ is not listed. Which of these three pears is Macarthur’s ‘Beurré Van Mons’ is impossible to say. There appears to be sufficient difference between the descriptions to make it unlikely that they all refer to the same pear. I have found no description of a pear that I can definitively call ‘Beurré Van Mons’ and in the absence of such a definitive description the one given in The Horticulturist and Journal of Rural Art and Rural Taste must stand. ‘Poire Délices’ (Van Mons) is figured in Album de Pomologie [ADP vol.4, pl.47/1851], which may be Macarthur’s ‘Beurré Van Mons’. The illustration is used here. Listed only in the 1857 catalogue in an Addendum as ‘Beurré Van Mons’ [Pear no.37/1857]. In a copy of the 1857 catalogue the number ‘37’ is changed to ‘40’ and this aligns with the diary numbering. ‘40. Delicious, melting.’ [Diary B, MP A2951/1862]. Obtained from Veitch’s Nursery, probably the original Exeter premises. 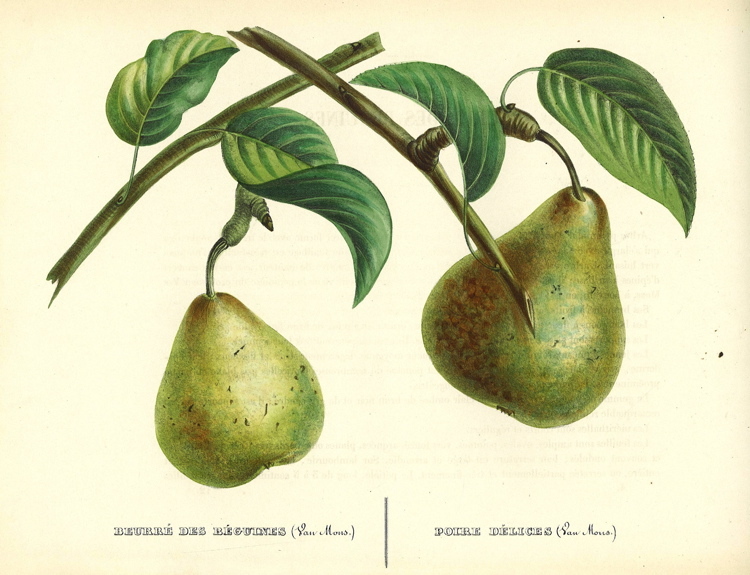 Pear ‘Beurré Van Mons’ | ADP vol.4, pl.47/1851 as ‘Poire Délices’ (Van Mons) | Pomologische Bibliothek. Poire Délices is the pear on the right.